The NEW K 5.540 electric pressure washer from Karcher, the top of the line unit in the X-Series range. This 2000 PSI model features a unique, patented water-cooled induction motor that delivers superior performance and a longer life. Only Karcher offers the advanced combination of water-cooled technology with a powerful induction motor. Equipped with two spray wands, the K 5.540 is able to tackle any cleaning project around the home. Are you looking for the best electric pressure washer in the market? If yes, you should know about Karcher X-Series K 5.540. 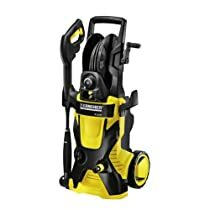 As the name already tells you, the X-series K 5.540 is the product of Karcher which is one of the most reliable and reputable manufacturers of the household and commercial cleaning tools. The company is known for their quality products which find expression in the X-series K 5.540 with 25-foot hose and hose real. It features a water cooled induction motor 2000 PSI which is the first in the industry. This model of Karcher cleaning tool is most suitable for home use. With the Karcher X-series, you will be able to clean any type of area thanks to the different nozzles it has. One remarkable thing about this product is the ease of use it offers users. It has great mobility which gives it an edge over other type of pressure washer in the market. You can easily move it from one location to another. It is capable of cleaning spots that are difficult to reach. The Karcher X-series is suitable for heavy cleaning as well as light cleaning in the house. Karcher X-series K 5.540 is one of the reliable electric pressure washers in the market. It has received numerous positive rating from some users. If you buy it you will gain the following advantages from it. It can be used to clean a lot of surfaces including mat, car, siding and concrete or brick platforms. It can handle any residential cleaning needs whether it is light or heavy duty cleaning. It offers amazing mobility or flexibility thanks to its lightweight. This means that you can work with it for hours and the weight of the machine will not constitute any problem to you. The height of the product is suitable for users to be able to move the tool about when they are working with it regardless of their heights. Karcher X-series K 5.540 is capable of cleaning the toughest stain on a surface without splashing any water about. The power unit is capable of generating impressive amount of power even though it cannot be compared with those of gas pressure washers. Despite the above mentioned advantages of this model of Karcher pressure washer, it is not the ideal machine without any spot. It has its own shortcoming which some online consumers have pointed out. Karcher X-series K 5.540 can easily fall over owing to the way it is made to stand in an upright position. Many consumers have complained in their reviews about the proneness of the Karcher X-Series K 5.540. A lot of consumers are happy with the level of cleaning they obtain from this machine as well as the amount of power it is capable of generating. However, some consumers are impressed with Karcher X-series K 5.540. This is normal in life. There is no one product that has satisfied every consumer no matter its quality. It is left for you to weigh the pros and cons in order determine whether it is suitable for you or not.